The kids all finished off the year with some great awards. Mom and Dad got to attend several award ceremonies to honor these fantastic kids. Trevor earned his Block R Award for the 2nd year in a row. 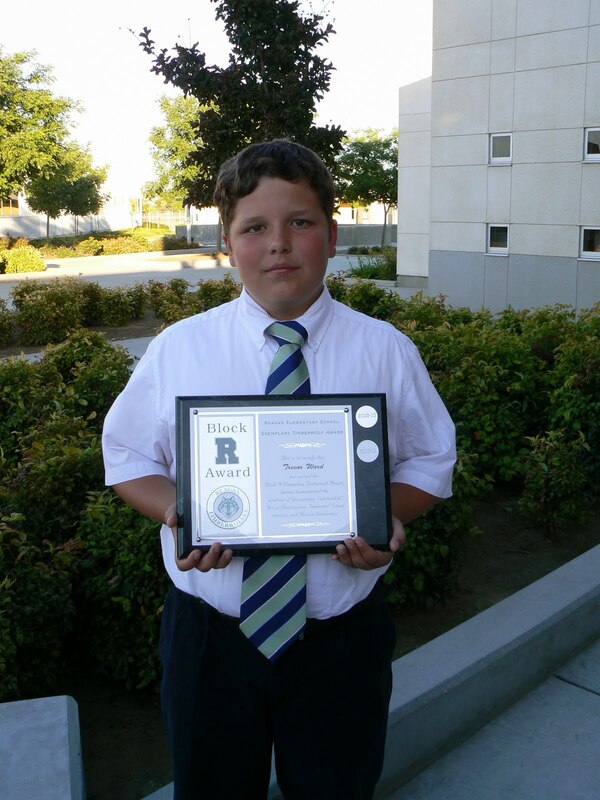 To earn this award he had to be involved with a bunch of extra-curricular activities while maintaining good grades. He soared in his academics this year! He earned High Honor Roll all 4 quarters! That is a HUGE accomplishment for our boy! Logan had a great year in athletics. His coaches were so impressed with him after each season for being consistent as one of the top performing athletes on his team. He was awarded with the Outstanding Runner trophy at the sports awards ceremony. Way to go Logan! 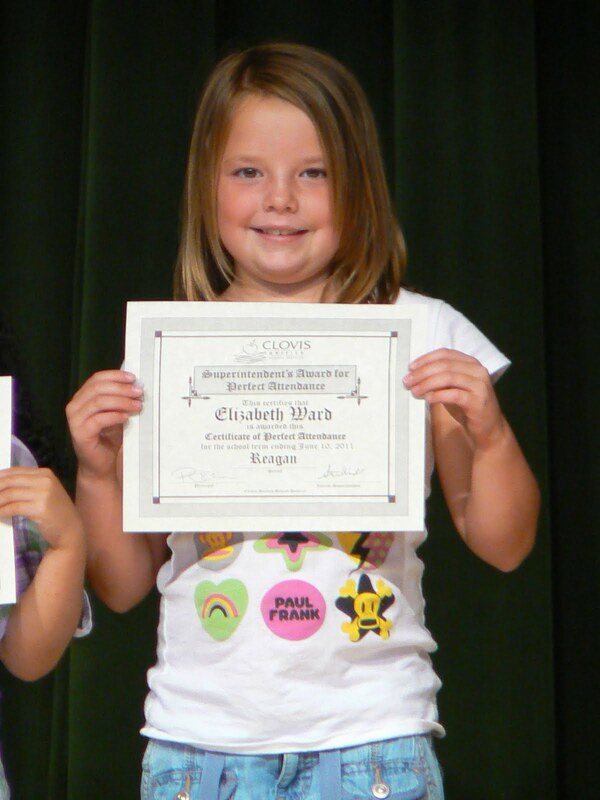 Lizzie had a great year in first grade. In fact, she liked it so much that she never missed a day! We were all so surprised to learn that she had earned Perfect Attendance for ALL 4 QUARTERS. Wow! Good Job Lizzie! Jackson looks forward to starting kindergarten this fall and is in for quite a surprise... ALL DAY kindergarten! None of our other kids experienced a full day of school during their first year in public school. Another school in our area has had huge success with their trial of an all day kindergarten program and now our school has decided to follow their example. I'm sure there will be a Jackson update at the start of the school year. We cross our fingers and toes to get a loving, patient teacher for our squirrely boy! For now, Jackson is happy to run wild in the backyard and soak up the long days of summer with all his backyard pals. We're having dinner as a family. Jackson's cup is empty and he is thirsty. He thrusts his empty cup towards Jeremy and says, "Daddy. More juice!" Jeremy says, "Excuse me? Jackson, you are supposed to say, 'more juice, please'." Jackson responds, "No daddy, YOU say, 'coming right up'!" Lizzie: Mommy, are there any old movies I haven't seen? Mommy: Yes, there are lots of old movies you haven't seen. Mommy: Well... let's see... have you seen Meet me in St. Louis? Mommy: Have you seen The Wizard of Oz? That's one of my favorite old movies. Lizzie: You're just like Oprah! Lizzie: You love The Wizard of Oz just like Oprah, but I hate that movie! Mommy: Well then, it sounds like you need to watch it again because it's the best. Summer is just about here... only one more day of school for the kiddos and then it's over. Or it's beginning? Either way you look at it, the kids will be home all summer! My friend, Leslie, made a list of all the fun things they'd be doing this summer. I thought I'd do the same - even if only to get ideas from others so we don't end up playing video games all the days long! Chuck E Cheese when reading charts are filled! What are you doing for family fun this summer to keep the summer doldrums away?